Ann Marie at household6diva is hosting a military spouse blog hop this weekend to connect spouses from all over the world and across all services. Feel free to join in and meet some of the most amazing military supporters on this planet. Every one of them serves their country simply because they love and married someone who is a member of the armed forces. We might be called “dependents,” however, we are anything but dependent! 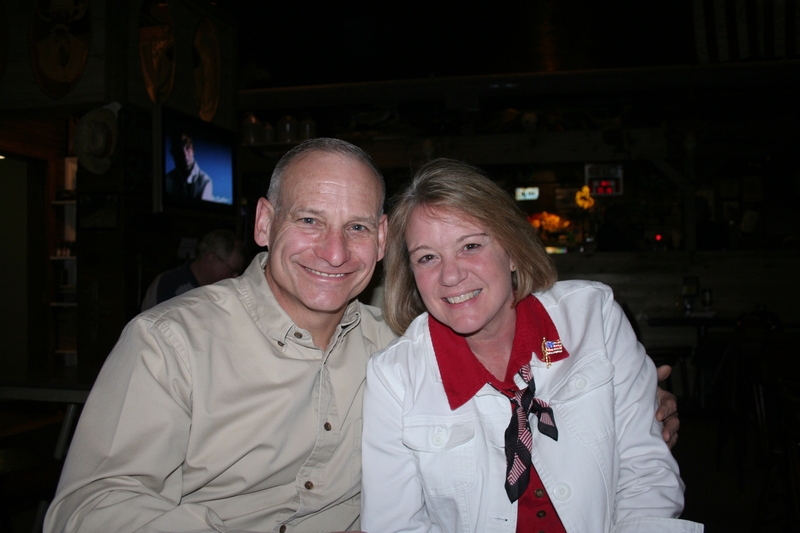 For those of you who are hooking up through the blog hop and meeting me for the first time, I’m an Air Force spouse and have been married to my airman for almost 35 years. This is a picture of us taken on October 1, 1977. We were such babies…still in our late teens! Jim was ROTC at the University of Cincinnati and neither of us had any clue what was ahead for us in the military. Our fathers had both served but we didn’t personally know anyone who had chosen to make it a career. This is us thirty-one years after his commissioning….and 22 moves later! Since then we’ve raised three sons, are grandparents to two adorable grandsons and I’ve pinned nine different ranks on his shoulders. It’s been an amazing ride and we are still on the bus, for a few more years anyway! Along the way what has made it all worthwhile is the people. We talk about the Air Force Family all the time for a very real reason. When we live away from our relatives it’s the people we live and work with on our bases who truly “get” us and who support us in all those instances when our own families wish so fervently they could be there to hold us up, but who can’t because of time and distance. 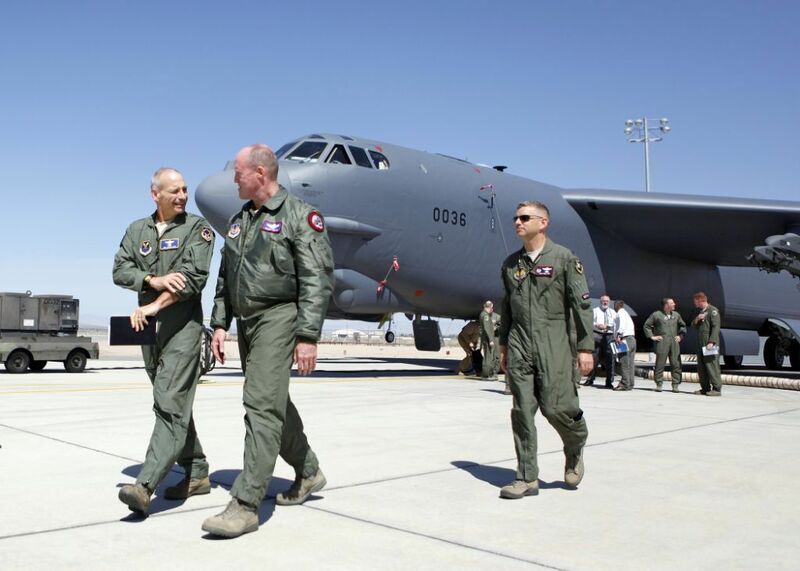 This picture of Jim was taken out on the flight line last week (he’s on the far left). I’m extremely proud of my husband and thankful that I’ve been along for this ride. 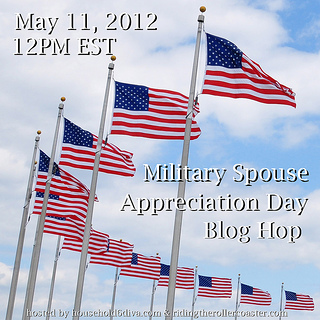 I’m proud to be a military spouse and I’m proud to stand beside all the other mil spouses that I look forward to meeting on this blog hop! LOVE it!!! … its an honor serving with you both.. 1st as a spouse.. and as a member of Global Strike… I love you guys!! Michele, you are one of the reasons Barksdale is such a great place to be. You light up any room you walk into! Greg and I are both extremely blessed to have had our paths cross with you almost 7 years ago. Both of you are outstanding mentors to us, and we feel exceptionally privileged to call you friends! Much love to all! Kristi, one of the reasons I’m glad this ride has been so long is so it could include people like you and Greg. Who knew we would go to a command so late in Jim’s career where we didn’t know more than a handful of people and end that command with the beginning of such a great and lasting friendship. Even though we no longer live on the same base i don’t know what I would have done without you this past year. I love your words and so glad you both are still on this wonderful bus. Thanks Suzie, let’s enjoy the ride together until that very last minute. 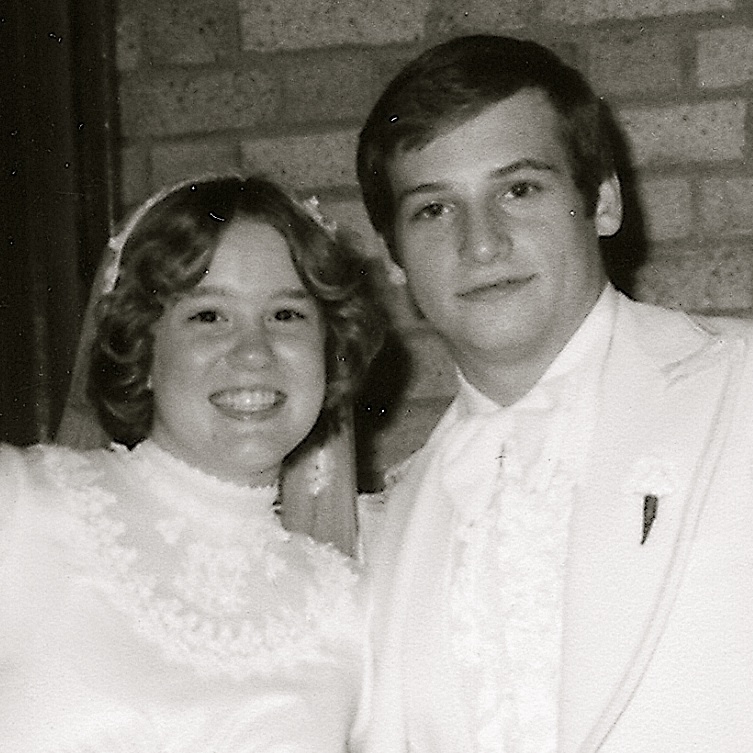 such an awesome thing to have been married for 35 years! stopping by from the blog hop 🙂 Nice to “meet” you! Thanks for stopping by Alia! This is my first blog hop and it’s been fun. Although, the learning curve was a little steep! Greetings from Alaska! I’m glad I found your blog through the BlogHop, and look forward to reading more. Happy (belated) MilSpouse Appreciation Day! Thanks Nina, I’m glad you stopped by! There are so many blogs in the hop! I’ve always wanted my husband to get an assignment in Alaska. I hope you love living there! Also stopping by from the bloghop! Happy MilSpouse Appreciation day! Happy Mil Spouse Appreciation Day to you also Lisa. Thanks for stopping by! I realize you are new to this Mil Spouse gig but you will love it and you’ll be amazed at how close you will get to other spouses. They become family pretty quickly if you give them a chance and open up to them. Getting involved is the key to being happy on a base or at an assignment! So nice to read about you & your family! Hope you had a blessed MSA & Mother’s Days! Heather, there’s a special place in heaven for Chaplains and their families! You will make such a difference in people’s lives. Thanks for stopping by! Hello! I came by to visit via the blog hop. I love what you have to say about the Air Force family! I definitely have to agree. The people who “get it” are such a blessing. It’s been a pleasure reading your blog!